In February at Future Decoded India, Microsoft launched Skype Lite, thier fastest and smallest app to date built for the Indian market. They announced the Aadhaar integration within Skype Lite would be coming in the summer of 2017 and confirmed the availability of Indian users. Aadhaar is considered to be the world’s largest national identification number project and allows users in India to communicate with government, business, and others with a higher level of trust and lower potential for fraud. 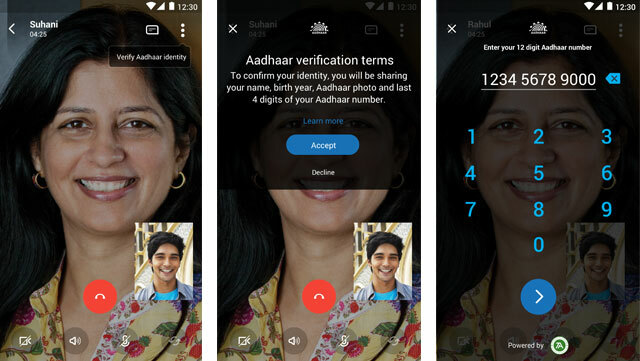 With the latest version of Skype Lite, Aadhaar integration can be used to verify users’ identity online, helping them communicate more securely with others. For example, you may wish to make a Skype Lite call to an important business client or government representative – by using Aadhaar, both parties can verify their identity at the beginning of the call to prevent impersonation fraud. Either party can request Aadhaar verification over a video call using Skype Lite. In order to confirm your identity, you’ll need to click on “Verify Aadhaar identity”, enter your 12-digit Aadhaar number and then authenticate with a one-time password sent via SMS. Once validated, you can choose to share pre-selected Aadhaar information with the other person to confirm your identity. You’ll still get the same great Skype Lite experience during the call and once you’ve finished speaking, both parties will see the Aadhaar verification captured as an event within the conversation. Skype will not store any Aadhaar information and as always, your personal information—including your video and audio conversations —is securely encrypted. Skype Lite is available to download on Android here. To share your feedback and get the latest news and tips, please follow us on Twitter, Facebook, and Instagram, and join us in the Skype Community.